Mount Your Embroidery on a Mirror! When Robert Burns consoled the Mouse, saying something about the best laid schemes o’ mice an’ men (undoubtedly in a heavy Scottish brogue) often going awry, I really think he was talking about me. I swear I’m the best layer-of-schemes in the world. But they always seem to be the kind that go awry. Take, for example, my plan for embroidering some beautiful little monograms and mounting them on mirror compacts, for a few of my nieces for Christmas. I had plans to make matching drawstring little bags, to house the mirror compacts in. And all decked out with pretty monograms…. my, my, ’twas sooch a good idea! I even went so far as to buy the mirrors. And once I had those in hand, you know, it was just a matter of whipping out a few pretty monograms, doing some quick finish work, monogramming the outside of the drawstring bags, constructing the bags, and having them ready for Christmas. I bought the mirrors at the end of November. Hmm. Perhaps it wasn’t the best best-laid scheme, after all. 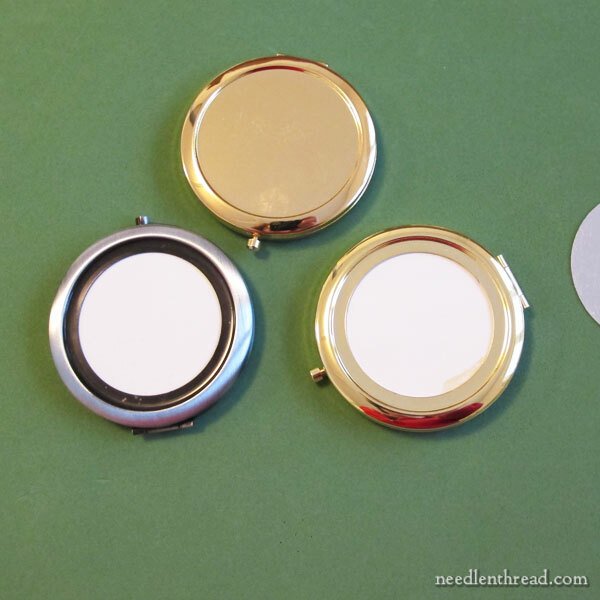 But, I thought I’d show the mirror compacts to you, because I’m always getting questions about what to do with finished pieces of embroidery. 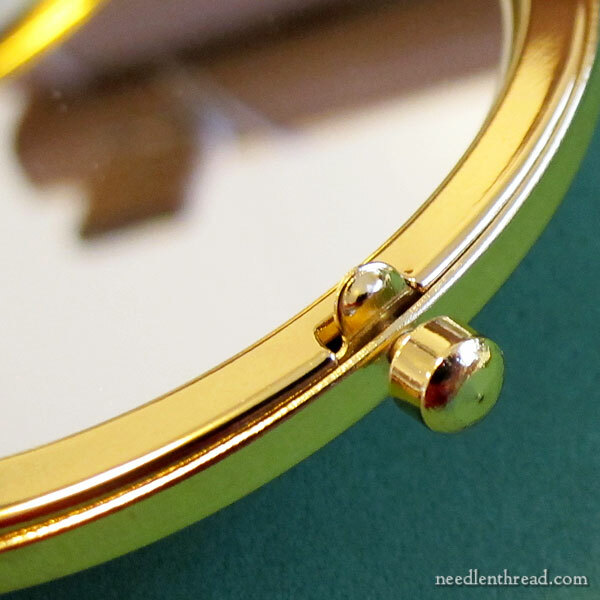 This is something you can do with finished, small pieces of embroidery – you can mount them on a mirror compact! 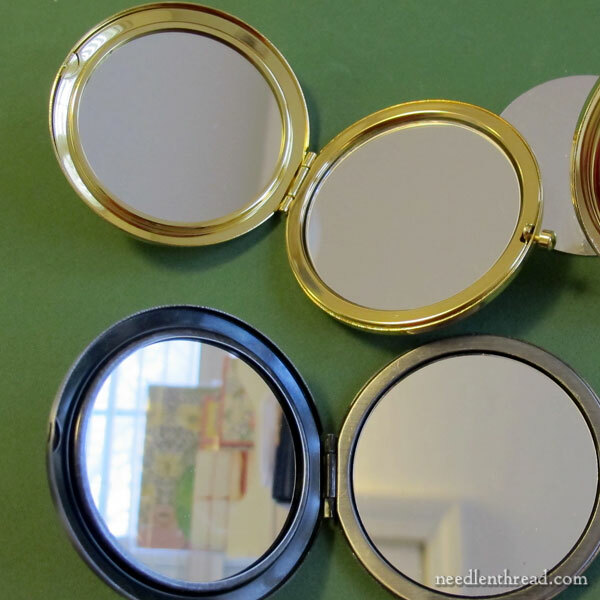 Mirror compacts make great gifts for gals, especially gals in the late teen – early twenties years (and older). Sure, they might not be into monograms and the like, but you can always go all out and create a whole work of embroidered art for the lid of a mirror compact. Remember Catherine Jordan’s Cool Waters dimensional embroidery on a compact I showed you last summer? Birthday gifts, bridesmaid’s gifts for wedding, a Mother’s Day gift – why not? These are very good quality compacts. They fit in the palm of your hand, and they have a nice bit of weight to them. They don’t feel light and chintzy. They come in two finishes, too – a brushed matte nickel finish and a bright gold finish. I like both finishes, but I really like the brushed nickel finish best. They have a strong clasp that releases with the bush of a little button. The mechanics are smooth and they feel substantial and strong. And on the inside, there are two mirrors, the close up one that you really don’t want to look into because it reveals too much, and the regular one. To mount embroidery on these, there’s no outer frame that fits over the embroider. Rather, there’s an indentation in the center of the lid, into which your embroidered piece can be mounted. The area for mounting is about 2 1/4″ – 2 3/8″ round, so the embroidery you prepare should fit inside a 2 1/4″ circle. The mounting is done by glueing. You’d embroider your decoration and then mount it on a card base (one padded with felt or Peltex would make the best finish, I think), and then you glue the finished round onto the lid of the compact. You can further embellish around the edge of the embroidery with a fine braid or cord, for a nice finish. 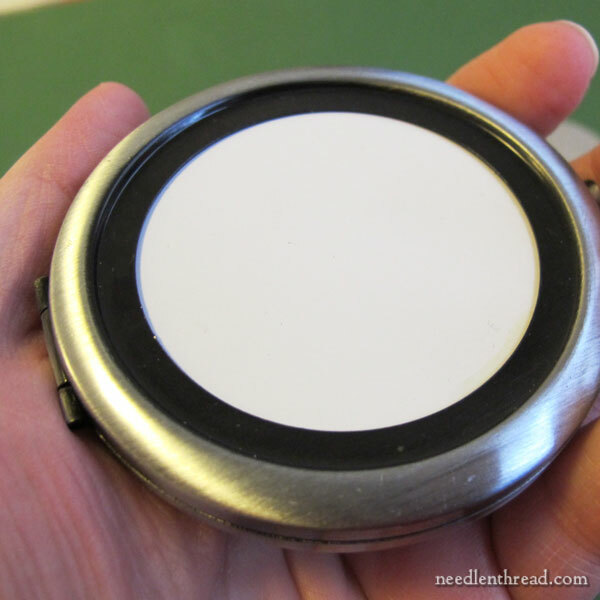 In my e-book Lavender Honey and Other Little Things, the method used to make each side of the pin-keep would be the perfect method for making a mountable disk for the top of the compact, and any of the round Little Things would make really fun decorations for the compact lid. They’re reasonably priced for good quality compacts, and the shipping and service are good. So, there’s an idea, if you’re scheming and planning to finish some small pieces of embroidery into something special! Thanks so much for sharing. What a wonderful gift idea. Makes giving an embroidered gift so fuctional. Just lovely. Thanks for your inspiring so much creativity. A modern design on silk gauze might be good on top too. Somehow those little stitches are interesting to look at. This idea appeals to me a lot, especially since I lost my little handbag mirror several years ago. (I keep hoping it will turn up!) One thing bothers me, though, and I wonder if it bothers you. Things get grimy from use, eventually, and there is going to be no way to clean the embroidery when that happens. I suppose that’s why you decided to make little carrying bags for yours, to keep them cleaner longer. Hmmm. Great minds think alike! I bought one of these fairly recently too, to try putting some embroidery on. I must get around to it! What a lovely idea. I have some old compacts perfect for this, thank you for sharing. Previous Previous post: Exquisitely Fine Detailed Embroidery – Can You Guess?